The quality of your service certainly goes a long way in filling your church on Sundays. Yet other factors also play a role in attracting congregants. One of the more important factors is the quality of your church parking lot. ACPLM is here to keep your church parking lot in tip-top shape. We’ll make sure your lot looks and feels fantastic throughout the entirety of the year. Do not lose sight of the fact that the parking lot is the first thing congregants experience when pulling in and out of your facility. Invest in the upkeep of your parking lot and people really will be more inclined to show up for services. Parking lot maintenance provides your facility with the curb appeal necessary to attract congregants. A well-maintained lot with an even surface, distinct parking lines and a clean look makes a meaningful difference from the perspective of those who make the decision to show up for Sunday services or stay at home. The bottom line is that looks matter a great deal. Lean on ACPLM for your parking lot maintenance and we will perform the work necessary to keep it looking gorgeous throughout the year. The average congregant weighs a number of factors when deciding whether he or she will attend Sunday service. The quality of the service matters as does the weather, past experiences at the church, the facility’s condition and the quality of the parking lot. If your church lacks ample parking spaces, clearly lined parking spaces and a smooth surface, congregants will undoubtedly hesitate to show up for Sunday services. 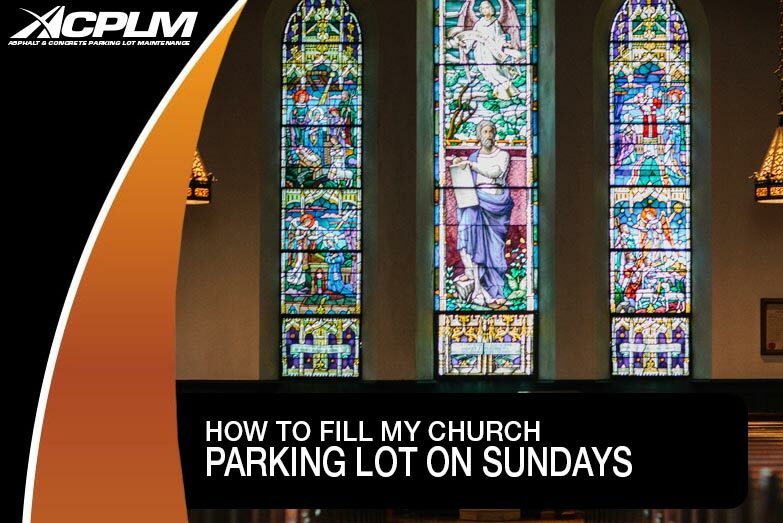 Let ACPLM handle your church parking lot maintenance so your church can meet its potential. Your congregants won’t have to worry about navigating between potholes, faded parking spot lines, an uneven surface, cracking and oil spots. Their focus will be on attending Sunday services and spending quality time with fellow congregants. This is exactly what your church needs to add to grow and fulfill your purpose. Be proactive by allying with ACPLM to keep your church parking lot at its best. This is your chance to make your parking lot a strength rather than a weakness. Our expertise will give your lot true curb appeal and make it easy to navigate. These are the subtleties that often tip the scales in favor of congregants returning for additional services. Contact ACPLM to learn more about our services and get a quote. We aim to exceed expectations to secure your business across the long haul. We are the parking lot experts you have been looking for.